We arrived in Banderas Bay over a month ago and it seems a bit mind-boggling that we’ve been in one place so long. Most of our time within the bay has been spent in La Cruz, either at anchor or in the marina, interspersed with adventures by boat and by bus. We’ve visited Punta de Mita, Bucerias, Nuevo Vallarta, and we’ve got plans to go to San Sebastian and maybe even venture into the tourist crazed metropolis of Puerto Vallarta! Being in La Cruz is like living in a perfect paradise town with a little bit of high school angst mixed in. There are so many cruisers here that there is a choice to be made whether to immerse yourself in the gringo community or enjoy a taste of a true Mexican fishing community. Think dinner under the Huanacaxtle trees enjoying fresh tortillas and camaronés versus high school lunch table cliques, or listening to flamenco guitar music backed up by the waves crashing onshore with your feet in the sand, versus garage band compliments of gray-haired hippies, or shopping in family owned bodegas and market stalls versus going to the Mega Supermarcado….comprendes? As with anything in life, the cruising life is what you make of it. We’ve met many wonderful people here, most of them fellow cruisers, but our preferences lean toward the small towns, quiet anchorages, and stumbling our way around the lifestyle of the locals. One of our favorite places for breakfast (desayuno) is a little spot next to an empty lot that is run by a local family. They have two or three tables set out under the trees, and in the morning we watch huge iguanas come out of the trees to sun themselves on the branches. The food is great, the family is very friendly and it’s a great spot! On Thursdays, there is a fruit and vegetable delivery for all the local restaurants, and the “warehouse” opens it’s doors to the locals so that we can partake of the great produce. We go through the store, through the supply room, out the back door across the dirt patio and into a large building complete with a few parrots screeching, to pick up some awesome fresh fruit and veggies out of the huge crates. Fresh stuff doesn’t last long in this heat, so it’s nice to be able to buy just a few items at a time. On Sundays we go to the big market that takes place along the malecon and the breakwater. We buy fresh bread, fresh fish and shrimp, and of course a few treasures! I have a new project that will be shown later that I’m going to make from a bunch of small tiles that we had made by a local craftsman. We try to only purchase from the vendors that make their own wares and it seems to usually be a family effort. So, this week is home remodel week – stay tuned for a blog on that! 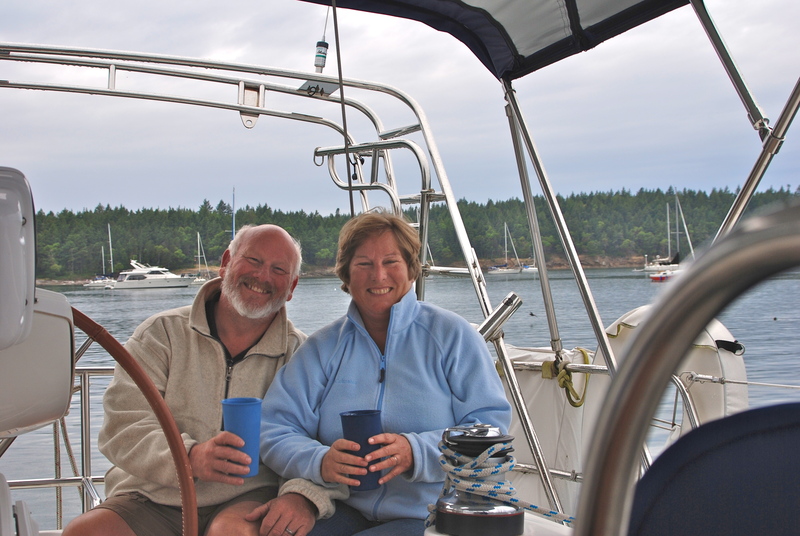 Some days we forego the trip to town and go out sailing, to look for whales or tortugas, or to just enjoy the peaceful sound of the wind in the sails. However we think the whales must be leaving the area because we haven’t seen nearly as many lately. In fact the last two times we’ve gone out looking, we didn’t see any out in the bay, but after dropping the anchor again we saw pairs of whales just off the anchorage doing lots of tail slaps and blows. We’ve decided that anchorages should always provide whale watching during happy hour! Mornings and evenings on the hook are the best (well, so is the rest of the day..ha). We sip fresh coffee in the cockpit, take a swim followed by a shower on the deck, watch the calm water for signs of rays swimming by, or listen to the schools of fish swirling the water around the hull. At night we watch the sunset, followed by stargazing. What could be better? All in all, we’ve enjoyed our month in Banderas Bay, but we’re getting eager to hoist the anchor and head back up into the Sea of Cortez. Been wondering what you guys were up to. Sounds like paradise. The teachers are on strike in my little district of Alpine since last Thursday with no end in sight. Negotiations continued through the weekend. Shrimp and a sunset would be a welcomed escape! Can hardly wait to see your “tile project”! Also looking forward to another Thursday night produce pickup as we are almost ready!!!! I love that area…but we stayed in Puerta Vallarta with all the other tourists and had to take taxis and hitchhike. Beautiful when you get out of town. We snorkeled several times off a small island…I don’t remember the name. Hired a fisherman to take us out on his day off. We provided the picnic and lots of beer! Life is good here too. We celebrated Preston’s 4th birthday yesterday with tons of friends. New bike was a hit! All are healthy, skiing is good finally, Mom is going strong. Love reading your posts and living the adventure vicariously! Love you both!